Elisabeth Knowles wakes up and smells the coffee in Newtown’s most respected coffee house. Campos Coffee was a Sydney institution long before lattes were the wake-up-call de rigeuer. It was once a higgledy-piggledy and somewhat dusty hole-in-the-wall coffee house where a knowledgeable but somewhat curmudgeonly (coffee)bean counter offered rare finds and unique blends for nerds ahead of the curve. It is now a light and airy space to enjoy a far-from-average joe. Campos managing director Will Young is just as passionate about coffee as his predecessor, but in the eight years since he took over the business he’s set about making it just that little bit more welcoming. The first thing to change was the ageing terrace-style shopfront, which is now a light-filled timber-floored café, complete with lovely fresh pastries. 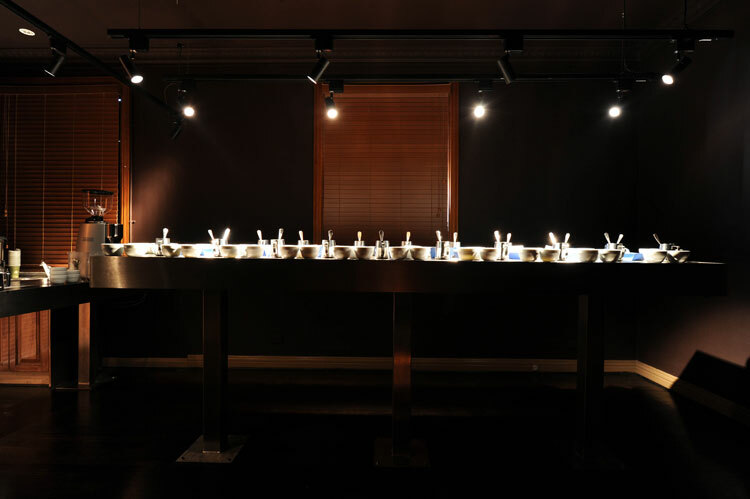 Most recently, as of October 2010, the upstairs has been transformed into a chic cupping room, where coffee appreciation experiences take place. 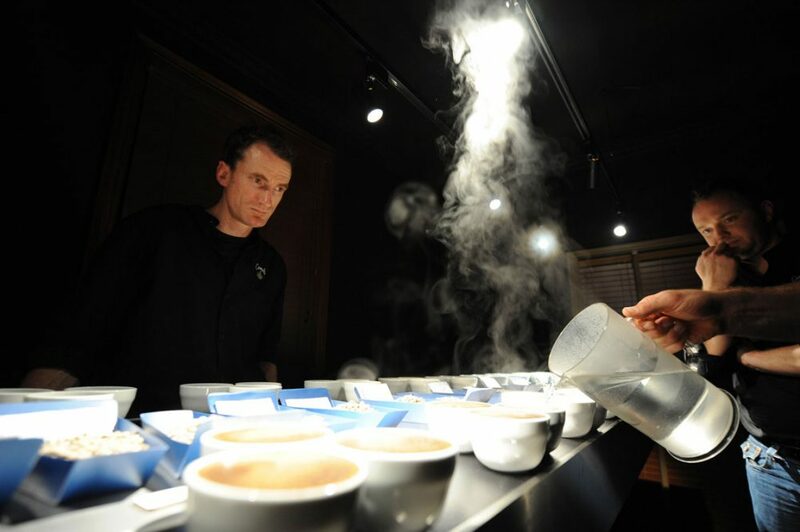 The experience is called “cupping”, and basically it’s the same tasting process that takes place the world over when a coffee buyer does business with a coffee trader. My cupping experience begins at 7.30am on a Tuesday morning. After being led up a dark stairwell, through a heavy dark door, I enter a dark black-walled room where a long, bar-style bench is lines with bowls of beans and rows of ceramic cups. There are five bean varieties to sample, and their quality is judged on their aromas when dry and wet. Today, we try Guatemala Natural, Ethiopian Lekempti, PNG Marawaka, Indian Monsoon Malabar and Kanyan Tembo, thus taking a sensory trip around most of the coffee-growing world. They are all single-origin and they were all roasted yesterday. Then there’s a supermarket brand for contrast. First we sniff the ground beans. Like most coffee, they all smell bitter. Rich and bitter. Some more rich, some less bitter than others. One smells nutty. That’s a nice one. I soon forget which one it is. Hopefully not the supermarket one or I’ll embarrass myself. Next, we stand before our row of cups as ten grams of coarsely ground coffee gets 5 ounces of 93-degree water poured on it. We wait for five minutes then break the crust. The Break, as it’s known, is not like cracking the top off a crème brulee, it’s more like skimming the surface of a coffee-filled swimming pool (though on a much smaller scale). With a desert spoon, we scoop back the crust then sniff again. Yum. Now for the actual tasting. As with wine tastings, you’re encouraged to spit. What I’m not expecting is the swift, grunting, slurping action with which you’re supposed to ingest your spoonful. June Dally-Watkins would keel over. It’s a bit early in the morning for me to get into the spirit, but I can imagine a roomful of blokes loving the liberty such moments afford. To be honest, I wasn’t expecting there to be much of a difference in taste between the coffee types. My palette just isn’t that sophisticated. But I’m surprised to find there actually are cherry notes in one, and distinctly lemony ones in another. I’m relieved to find that in comparison, the supermarket coffee actually does taste decidedly more poor. Cupping is a truly informative experience. I’ve always loved my coffee but I’m hardly a coffee snob so it’s a relief to find the other participants in these courses are more interested in food appreciation than criticism. Despite the fact I spit (though I don’t snort or slurp) I still feel that unmistakable coffee buzz as I head downstairs to leave. I can’t help grabbing a takeaway latte on the way out. Looking to Get Cupped ion Melbourne? Check out our Dope Wars story.